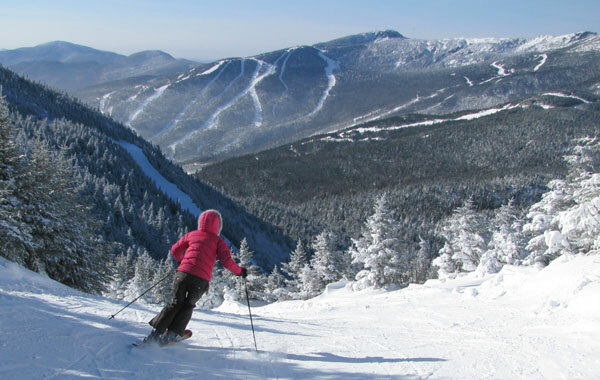 Smugglers’ Notch in Vermont is the place to go with your young family of skiers. This northern Vermont resort knows how to entertain kids from small to tall – with some of the best lesson programs in the business. 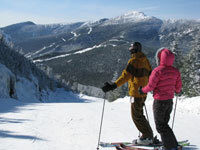 Smugglers’ Notch is award-winning when it comes to activities for families – on snow and off, day and into the night. The slopeside village provides a resort setting ideal for your week’s stay, with tons of condos. The well-oiled, cheery ski and snowboard instructors at The Snowsports University will have your whole family learning to turn in no time. Mascots Mogul Mouse and Billy Bob Bear will make you smile all the while. The skiing on three interconnected mountains is served by old fashioned fixed grip double chairs so Smuggs is not fancy but its very family friendly. Morse at the Village base is beginner oriented while upper mountains Sterling offers more intermediate and Madonna has some serious Kick A terrain plus fantastic scenery from the summit. Look for a new all natural terrain park at Smuggs on Knights Revenge glade on Madonna. Expert adults, bribe a local with beer to smuggle you into the backside of the Notch from Sterling.